You know that time when you MUST eat something not at all healthy? I had one of those times recently. Here was my purchase. And you know what? They weren't bad. The vanilla cookie was typical Oreo quality, crunchy and solid. The inner filling was the usual texture of the vanilla filling in a typical Oreo, only it was lemon flavored. It was not overpoweringly lemon, either. It wasn't like taking a bite out of a lemon. It was light, just enough, I feel. The overall taste of the cookie was very good. I like lemon cookies. You can buy "generic" brand lemon cookies in this style. Is there a benefit to buying Oreo brand? Not really. Still, they were on sale and, if I found them on sale again, I would consider buying them. I divided the package into smaller bags of 5 cookies each, after I'd eaten one side of the bag during a WOW raid. I grabbed a package with my lunch and 5 cookies was just enough to make a long afternoon at work feel not so long. 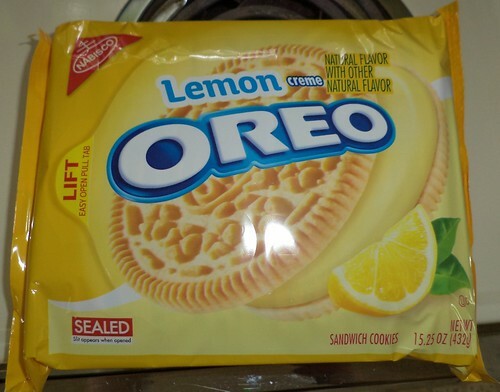 So, unlike other foods under this headline, I think these are okay and can recommend them, if you like lemon cookies. These aren't dunking cookies. I don't think I would eat them with milk, but they are a fun flavor in the seemingly endless versions companies are churning out in the drive to increase market share.